King Jackpot screams cool from the minute you get in. To give you a picture, you walk your character through the very modern looking castle turned bingo hall. Certainly a unique concept! You interact with other players and navigate the 3D world by clicking around. After walking up the staircase you choose which type of game you want to play. Alongside the standard credit and debit card options, players have the option to deposit funds into their account via Neteller or Ukash. The withdrawal process is very simple and is available for the above methods. The games they have at King Jackpot include the full range of bingo games (75 ball, 90 ball, etc. ), slot machines (over 20) including well known brands Monopoly, Cluedo, and Elvis, as well as some sleek new additions, Posh Life and Jackpot Jamboree. There are also a huge range of side games which you can play while in a game of bingo. If that’s not to your fancy, there are the casino games, Keno, Roulette and Scratch Cards. After registering new players are treated to a assortment of specials designed especially for them. Play bingo with a free no deposit gift exclusively for new sign up players. Not only can players try out bingo for free at King Jackpot but a generous amount of free spins for slots are included. Once players are ready to make their first deposit a colossal free cash bonus is added to their bankroll. Reload Bonuses are available with an amount that varies depending on player status. Refer your friends to come register and a bingo buck rewarded is placed in your player account. When they make their first deposit more bingo bucks are added to your account. 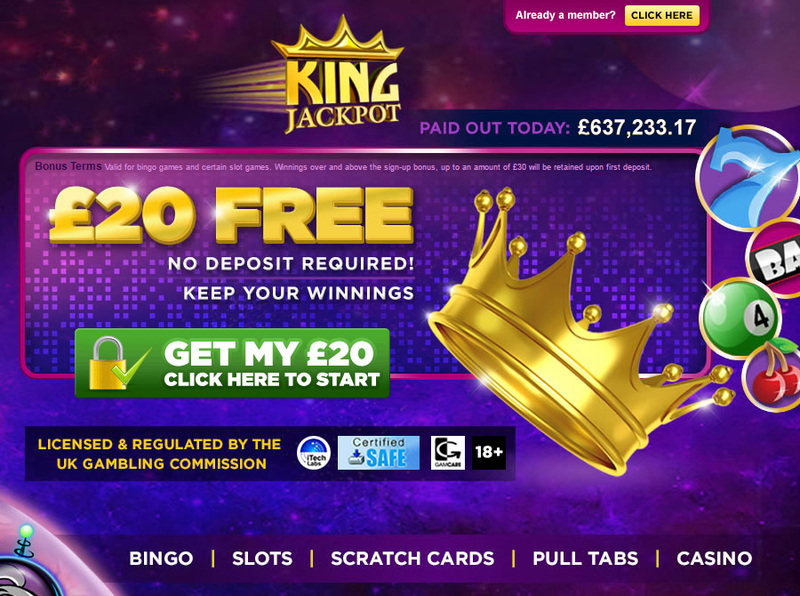 With strong emphasis on customer satisfaction, King Jackpot brings players a number of ways to contact them via email or live chat. The staff are available 24/7 to see to your every need. Your query is often resolved on the spot to avoid any frustration.